I would have never imagined that more than twenty years later I was going to move to Boulder. A democratic and liberal island in the republican and conservative state of Colorado, this (not so) small town witnessed in 1978 the most famous alien landing since the Roswell UFO incident. Traveling from a far away galaxy, Mork’s egg-shaped spacecraft landed that summer in the life of 21 year old Mindy, as well as in my pre-school fervid imaginary. A confirmation that the world as described in my favorite Japanese anime was real, that aliens were among us, and I was possibly one of them. I woke up at 4 am, the first day of my american life. And I had no idea about where I was. Yes, this was my new apartment, and yes, I was arrived the night before — flying from Atlanta to Denver — and then by airport-van to this address in the middle of nowhere. It was night, I did not sleep since leaving Europe, so I just picked up the keys and went to bed. With a map in my hands, and the instructions of an annoyed lady working at the gas pump, I could finally direct my steps in the right direction. I waited a quarter of a century, but here I was, 1619 Pine Street: the house of Mork and Mindy. 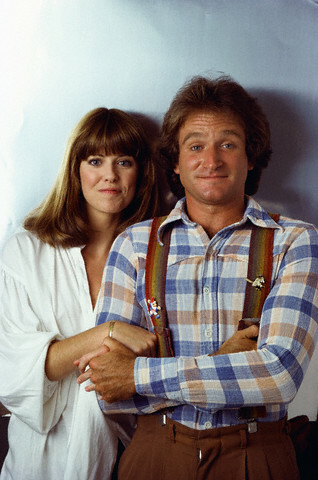 I guess Mork returned to Ork, but what about Mindy? I was quite surprised to find out that actress Pam Dawber is married since 1987 with Mark Harmon, NCIS Special Agent Leroy Jethro Gibbs. After her role in Mork and Mindy, Pam played in few other movies, and television series — most noticeably as Samantha Russell in My Sister Sam. A destiny similar to Carrie Fisher — the most famous Princess Leia.